Select Length 4" 7" 11"
Halar® Cable Ties (ECTFE [ethylene-chlorotrifluoroethylene]), have properties similar to Tefzel. The major difference (besides the price) is that Halar resin is rated for use in plenum spaces. This is due to its low smoke density when burned. Its durability is similar to Nylon, and is has excellent impact resistance at normal temperatures as well as at very low temperatures. Halar has good tensile, flexural, and wear-related properties. Halar is also highly gamma resistant, and is rated for temperatures from -50°C to 150°C. It is also UV resistant and carries a UL 94V-0 flame rating. Basically, if you need good resistance to almost any environment, but low smoke generation (i.e. plenum) is not a concern, go with Tefzel ties, otherwise if you require that all of your components be suitable for plenum (air-handling) spaces, go with Halar ties. 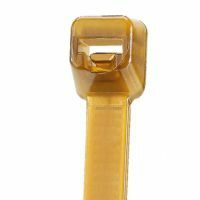 Buyheatshrink.com offers its customers different variations of the Halar cable ties, ranging from different nominal sizes to different minimum loop tensile strength. The shortest nominal size Halar cable tie is the 4” with a maximum bundle diameter of 0.9”. The 4” Halar cable has a minimum loop tensile strength of 18 pounds. The 7” Halar cable ties has a maximum bundle diamtere of 1.9” and the 11” Halar cable tie has a maximum bundle diameter of 3.0”. Both the 7” and 11” Halar cable ties have a minimum loop tensile strength of 50 pounds. Please note that all variations of Halar cable ties come in 100 quantity bags and only in red. Be sure to check out our cable tie tools to help with the cutting off of excess cable tie and to help adjust tensioning. Panduit Halar® Plenum Rated Cable Ties (ECTFE) are rated and listed by UL for use in plenum or air handling spaces per NEC, Section 300-22 (C) and (D). These heavy duty cable ties have a low smoke density and have a flammability rating of UL 94V-0. You can find these Panduit cable ties as a solution for bundling cables without conduit in air handling space application. Such environments include nuclear plants, environments with chemicals, telecommunication equipment, environments dealing with aerospace, and extreme high and low temperature settings. Halar Cable Ties are sold in the familiar maroon color that most inspectors look for. 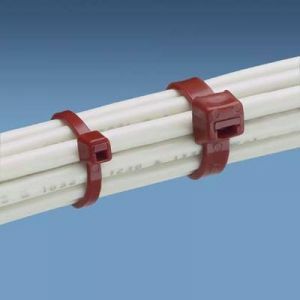 Here at Buyheatshrink.com, we offer a variety of Panduit Halar Zip Ties ranging from nominal sizes of 4" to 11.6". The 4" Panduit Halar Cable Tie has a loop tensile strength of 18 pounds, the 7.4" cable ties have a loop tensile strength of 50 pounds and the 11.6" cable ties have a loop tensile strength of 50 pounds.